Gadgets help us narrow down our location, take photographs, analyze, construct dynamic tables and charts, store the accumulated data in the clouds and draw conclusions based on it. They transform the “living” into “dynamic”, “warm” — into “favorable temperature setting”, and “love” — into “hormonal release”. 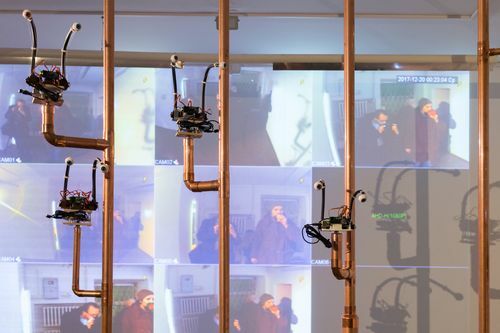 In the installation “Living Tapestry”, robotic eyes track the viewer, registering each of his movements and creating in real time a fabric out of video fragments that is similar to “textile pixels” in the traditional tapestries. The servo-engines are clicking, and one can hear the subdued noise of the crowd — it is as if frozen imaged came to life and turned into the tapestry that has taken on a life of its own.